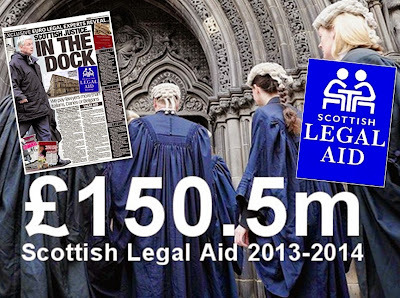 £150m annual legal aid bill ‘a fraud target’ DOCUMENTS revealing how an agreement was eventually secured by the Scottish Legal Aid Board (SLAB) & Civil Recovery Unit of the Crown Office & Procurator Fiscal Service (COPFS) to recover £1.8million in fraudulently claimed legal aid have been released by Legal Aid chiefs. The case of Scotland’s largest legal aid fraud – masterminded by solicitor James Muir who committed suicide in 2005 while under investigation for making multiple & fraudulent claims for publicly funded legal aid – echoes forward to 2015 as the annual legal aid bill of £150 million becomes an ever increasing target for scammers & fraudsters both inside & outside the legal profession. 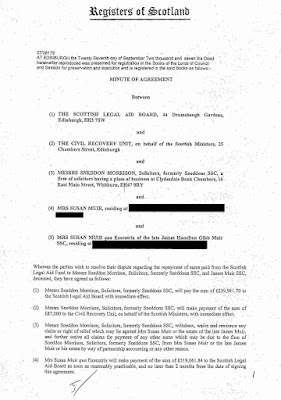 A minute of agreement archived at the Registers of Scotland and released by SLAB in response to a Freedom of Information request tells the tale of how the stolen public funds were eventually paid back by Muir’s former law firm and his window - Susan Muir – who was a serving Police Officer at the time. The agreement was signed in September 2007 – two years after Mr Muir committed suicide. The document describes how Muir’s former law firm - Messrs Sneddon Morrison Solicitors (formerly Sneddons SSC) would repay £259,941,70 to the Scottish Legal Aid Board, and £87,000 to the Civil Recovery Unit of the Crown Office. Susan Muir, the widow of James Muir, agreed to repay £519,061.84 to the Scottish Legal Aid Board and then a further £884,000 to the Civil Recovery Unit from the sale of a property in Bothwell. One of the witnesses to the agreement is William Macreath – head of Glasgow based law firm Levy & Mcrae. At the time, and currently, the same law firm represent the Legal Defence Union and the Scottish Police Federation. Currently, Levy & Mcrae are battling a multi million pound writ lodged against them in connection with allegations over their role in the collapse of Heather Capital,a £400million hedge fund. However, while the two year effort to recover the fraudulently claimed legal aid and it’s ‘eventual’ repayment was championed by SLAB and the Crown Office at the time, there are questions now as to why the Lord Advocate has not used similar methods to recover millions more in public cash from other lawyers who have also been accused of making dodgy legal aid claims. Since 2007, numerous solicitors accused of making false or fraudulent legal aid claims have featured in media headlines. In April 2011 a Sunday Mail newspaper investigation revealed Kilmarnock solicitor Niels S Lockhart had claimed at least £600,000 of taxpayers' money in just two years. A Report to the Law Society of Scotland Section 31, Legal Aid (Scotland) Act 1986: Niels S Lockhart released by the Scottish Legal Aid Board to the media - accused Lockhart of deliberately ramping up his claims. After Lockhart ignored a warning from SLAB to curb his claims, the Scottish Legal Aid Board investigated before a probe team concluded that his applications were a systematic attempt to create extra fees. But despite deciding that he routinely made "unnecessary and excessive" claims, SLAB did not call in police. They referred Lockhart to the Law Society of Scotland who also decided no fraud had taken place. A further investigation by Sunday Mail newspaper in 2011 established that fourteen solicitors accused of making fraudulent legal aid claims escaped prosecution by the Crown Office. However, unlike in the James Muir case, the Scottish Legal Aid Board and the Crown Office appear to have made no attempts whatsoever to recover public funds in the additional cases - which could potentially total millions of pounds. The firm of James H G Muir SSC was subject to investigation by the Board's Compliance and Solicitor Investigation unit from November 2004. The firm was identified through the Board's on-going programme of monitoring and investigating of legal aid expenditure. Issues were identified from an analysis of expenditure, and investigation work on the profile of applications received and accounts submitted for payment in respect of Children's cases by the firm. Theses issues included the persistently high cost of cases, the nature of the subject matter, the content of material submitted with accounts, as well as inconsistencies between the personal details of children on applications submitted and the same information included with the accounts. These aspects, together with discrepancies in information submitted by Mr Muir subsequently cross-checked with third parties such as the Scottish Court Service and Scottish Children Reporter Agency, caused sufficient concern for the Board to contact the Crown Office and Procurator Fiscal Service ("COPFS") in February 2005. COPFS in turn instructed Strathclyde Police to investigate the matter. Mr Muir died on 20 April 2005. The criminal section of the Crown Office could not carry out in further investigative work as, with the death of Mr Muir, there could be no prosecution of any party. Mr Muir's death also presented a number of matters that required to be resolved. These included the ingathering of the Estate, the involvement of the Civil Recovery unit and the work of forensic accountants in establishing any 'dirty money' streams to assets. The CRU worked to preserve and identify assets, while the Board sought to establish the extent of any fraudulent activities and charges made by Mr Muir. This work not only involved investigating Mr Muir's firm, which was established in 2001, but also required us to consider his activities when he was a Partner with his previous firm, Sneddon Morrison. Once the extent of the fraud, the most serious ever uncovered by the Board, was established at £1,8m, it was then a matter to secure the recovery of the sums from both the estate of the late Mr Muir and in addition the firm of Sneddon Morrison. It was established that the partners and staff of Sneddon Morrison were not involved in the fraudulent scheme carried out by Mr Muir when a partner, but the firm did benefit from the fraudulent payments and consequently were required to repay these sums, which they did. A considerable amount of analysis, enquiry and investigation was dedicated to this case. Work had to be done to demonstrate to all relevant parties that Mr Muir had indeed perpetuated a fraudulent scheme on the Board over several years, and in respect of the Proceeds of Crime all the defrauded sums had to be repaid. This was achieved without having to resort to costly and lengthy court proceedings, although this was a course of action the Board and the Civil Recovery Unit would have taken, and had been ready to take, had it proved necessary. A Minute of Agreement was signed and lodged in September 2007 and thereafter the defrauded sums were repaid which includes the £812,827 paid to the Board as detailed above. As you will appreciate the period from the initial enquiry in 2004 to the final recovery of fraudulently claimed funds in 2007 involved considerable time and a number of Board staff dedicated to investigate this matter adequately. Initially the focus was on Mr Muir's own firm but as the enquiry widened other cases in respect of Accounts paid to Sneddon Morrison were also considered. Much of 2005 was devoted to the retrieval of information and during this time the Board liaised closely with the Civil Recovery Unit to ensure all assets were identified and all sums that could be classified as fraudulently claimed were repaid. It is of course a matter of regret that Mr Muir died during the investigation but consequently the nature of the enquiry changed from one in respect of fraud to recovery. It took some months for the Board to establish the extent of the fraud as it did for the Executor of the late Mr Muir's estate to in-gather sums and to realise assets: this meant that work on this case continued throughout 2006. The Board and the Civil Recovery Unit agreed figures for repayment from both the Estate and the Partners of Sneddon Morrison, and this process of negotiation—which took some months and active involvement of the Board's senior management—was successfully concluded in 2007 when the fraudulent sums were finally repaid. The fraud was initially identified as a result of the Board's implementing a new process for internal review of Legal Aid expenditure: that process highlighted the activities of Mr Muir. The Board has a proactive counter fraud culture. This includes the on-site audit of all firms and solicitor registered for Criminal Legal Assistance, an Accounts Verification Unit with access to the Scottish Court Service system to enable third party verification, a process that can also adopted in respect of the Scottish Prison Service and Police Offices. In addition there is an imbedded Analysis and Management Information unit within the Board that actively monitors trends in Legal Aid expenditure by firm and individual solicitors highlighting any changes or anomalies that require further clarification or enquiry. (1) Messrs Sneddon Morrison, Solicitors, formerly Sneddons SSC, will pay the sum of £259,941,70 to the Scottish Legal Aid Board with immediate effect. (2) Messrs Sneddon Morrison, Solicitors, formerly Sneddons SSC, will make payment of the sum of £87,000 to the Civil Recovery Unit, on behalf of the Scottish Ministers, with immediate effect. (3) Messrs Sneddon Morrison, Solicitors, formerly Sneddons SSC, withdraw, waive and renounce any claim or right of relief which may lie against Mrs Susan Muir or the estate of the late James Muir, and further waive all claims for payment of any other sums which may be due to the firm of Sneddon Morrison, Solicitors, formerly Sneddons SSC, from Mrs Susan Muir or the late James Muir or his estate by way of partnership accounting or any other reason. (5) Susan Muir-will arrange for the dwellinghouse to be marketed for sale within 1 month of the date of this agreement, in the event that such steps have not already been initiated by her prior to signature of this agreement. (6) Susan Muir will make payment of the sum of £884,000 to the Civil Recovery Unit, on behalf of the Scottish Ministers, from the free proceeds of the sale of that dwellinghouse and from monies within her late husband's estate being the balance after payment of those sums identified as payable to the Scottish Legal Aid Board and from monies within such accounts and/or other investments as are directly related to savings or investments from the late Mr Muir's earnings from the Scottish Legal Aid Fund. Where any portion of that sum is derived from.the free proceeds of sale of the dwellinghouse, payment of that portion will be made within 4 months of the date of signing this agreement. Where any portion of that sum is derived from any other sources, payment will be made within 2 months of the date of signing this agreement. (7) Susan Muir, as an individual and qua executrix withdraws, waives and renounces any claim or right of relief which may lie against the firm of Sneddon Morrison, Solicitors, formerly Sneddons SSC, and the whole partners thereof. (8) All payments made under this agreement are net of VAT, and any refund of VAT made to either Messrs Sneddon Morrison, Solicitors, formerly Sneddons SSC, or Susan Muir, qua executrix or otherwise, in respect of the payments which are the subject of this agreement, shall be paid to the Scottish Legal Aid Board. Any refund of Income Tax made to Susan Muir, qua executrix or otherwise, in respect of the payments which are the subject of this agreement, shall be paid to the Scottish Legal Aid Board. ­(9) The Scottish Legal Aid Board and the Civil Recovery Unit, on behalf of the Scottish Ministers, discharge the parties to this agreement of the respective claims against said parties upon payment in full of all sums due to them in terms of clauses 1, 2, 4 and 6 by those parties under this agreement. (10) The above agreement is without prejudice to the right of the Scottish Legal Aid Board and the Civil Recovery Unit, on behalf of the Scottish Ministers, to initiate appropriate proceedings in the event that any party fails to make payment as agreed upon. (11) The Scottish Legal Aid Board by Tom Crighton Murray, Director of Legal Services and Applications, at Edinburgh on the Seventh day of September Two Thousand and Seven; and they are signed on behalf of the said Civil Recovery Unit, on behalf of the Scottish Ministers, by Lorna Hams, Head of the Civil Recovery Unit, at Edinburgh on the Seventh day of September Two Thousand and Seven in the presence of Claire Meikle, witness, of Victoria Quay, Edinburgh; and they are signed on behalf of the said Messrs Sneddon Morrison, SSC, by Roy Donald Lumsden, Eric Robert Lumsden, David Andrew Johnstone and James Morrison, four of their partners, and the said James Morrison has adhibited the firm name of Sneddon Morrison & Co, all at Whitburn, West Lothian on the Fourth day of September Two Thousand and Seven in the presence of Graeme Alexander Laird, witness, of West Main Street, Whitburn; and they are signed by the said Susan Muir, as an individual, at Glasgow on the Sixth day of September Two Thousand and Seven in the presence of William Couperthwaite Macreath, witness, of 266 St Vincent Street, Glasgow, G2 5RL; and they are signed by the said Susan Muir, qua Executrix of the late James Hamilton Gibb Muir SSC, at Glasgow on the Sixth day of September Two Thousand and Seven in the presence of William Couperthwaite Macreath, witness, of 266 St Vincent Street, Glasgow, G2 5RL. Given two years to pay back a £1.8m fraud? Something up there.A lot of reading between the lines required for that rather dodgy statement from SLAB. If only they went after all legal aid cheat lawyers like they did in this case,or did they? I am guessing as you published all the papers there is something going on in the background we are not meant to know.Am I right? So they should now go after all the others you mentioned and take back the false claims for legal aid! The 14 case investigation is ridiculous!If 14 clients had been accused of legal aid you can bet every one would have been in a headline and money repaid so why not the same treatment for bent lawyers! William Macreath joined Levy & McRae as a Partner in 1990. He deals mainly with professional clients such as doctors, lawyers and surveyors advising on partnership matters as well as professional issues affecting such clients. He also appears before professional bodies on their behalf and lectures to his own colleagues and other groups on professional matters. A graduate of the University of Glasgow, he has conducted many trials and civil actions during his years with Levy & McRae. He has a special interest in Professional Ethics and its impact on all professionals as they seek a move from self-regulation to external monitoring. He also advises Solicitors, particularly on the Accounts Rules, which play a significant role in the lives of all private practice lawyers. He is a founding Director of the Legal Defence Union - whose objectives are to champion and protect the interests of lawyers. He also represents many lawyers in all matters, particularly professional disputes and complaints which include appearances before the Solicitors' Discipline Tribunal. Following on from my earlier comment a cursory glance at the remaining coverage of the James Muir fraud brings no published references to Macreath's role or that of the LDU. Makes it all the more interesting the Scottish Legal Aid Board released the agreement to you under Freedom of Information. As this document is available at RoS I would not have expected any redactions under FOI.Are the redactions yours or SLAB? That is what happens when they are all pals, a disgrace. Who would trust this vile profession? I don't know how other people feel but I cannot find words to express my utter revulsion at these people, and their corrupt self policing. Did the suicide by any chance spike efforts to go after other legal aid fraudsters in the profession?I can only imagine the howls of protest from the Law Society and the scenario where this episode was/is waved at SLAB/COPFS every time there was a report of a solicitor making fraudulent legal aid claims. Redactions were applied prior to publication on signatures and certain addresses to avoid issues of privacy given the document can now be viewed more widely as an FOI release. It should be noted the Scottish Legal Aid Board did file a complaint with the Law Society of Scotland as referred to in SLAB's S31 report on Niels Lockhart. The Law Society then failed to investigate the complaint properly, assigning a number of 'investigators' to the case and the saga of what happened to SLAB's complaint, culminating in an agreement brokered by the Legal Defence Union, is told in previous reports. I imagine Slab will be on the receiving end of another ear bashing about this release to you.Last time re the Lockhart thing a certain solicitor was on the phone in a very threatening and insulting manner. Yes very interesting hands up anyone who knows someone given two years! to pay back a £1.8 million pound fraud! Someone at SLAB who respects your work says your blog has done more to combat legal aid fraud in the past few years than the Law Society, Crown Office or Scottish Government. A feather in your cap Peter which no one can deny.